Ever imagined a top Government of India-appointed committee walking out of a public hearing organized by it to consult influential groups on an important policy issue? This is what happened on September 27 in Karnataka, where the High Level Committee headed by TSR Subramanian, former Union Cabinet Secretary, constituted by the Union Ministry of Environment and Forests and Climate Change to review environment, pollution control and forest conservation laws, at Vikas Soudha, the high security office complex of the Government of Karnataka. Advertisements that the committee would be visiting the Vikas Soudha were issued by the Karnataka Department of Forest, Ecology and Environment on September 21, 2014, followed up by various press releases inviting the public to interact with the Committee. But finding strong reactions of groups known for taking up environmental issues, in an unprecedented move, in less an hour Subramanian got up and said “We will end the joke here!” and walked out! He was followed by the rest of the Committee members, who included Justice AK Srivatsav (retd Judge of the Delhi High Court) and KN Bhat, Senior Advocate. Though they demanded the Committee return, neither did the High Level Committee return, nor did any official of the Ministry of Environment and Forests or Karnataka Environment Department come back to explain the behaviour.” The flashpoint came when a representative from Mavallipura district sought to speak, saying he represents a community impacted by mal-development and waste dumping in his village, but he was brushed aside. Even before the public hearing began the authorities’ behaviour was not friendly, the statement suggested. “When various individuals and representatives of public interest environmental and social action groups turned up for the meeting, the police prevented their entry at the gates. It was only following a spot protest that the police consented to allow them to participate in the consultation. Despite this indignifying experience, all who gathered proceeded to the meeting hall with the intent of engaging with the High Level Committee”, it added. The meeting commenced with introductory remarks by Subramanian. 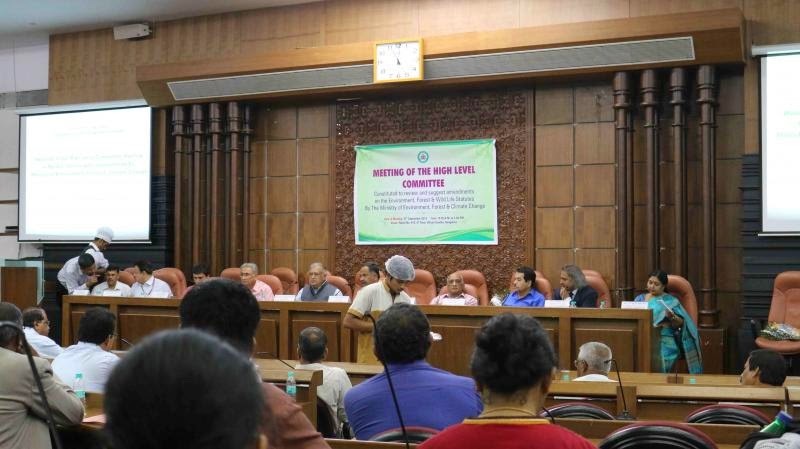 Broadly, he shared that the intent of the Committee was to hear views from across India on the type and nature of changes that were required in the environmental and forest protection laws. He stated that the Committee had the mandate of the Government to propose necessary changes that would help improve the quality of life and environment. But he said the need to ensure development was primary, as the country was very poor (over 80% were poor he claimed) and thereby it is found essential to streamline environmental clearance processes that thwarted growth. “Subramanian also shared that it was a matter of concern to the Government that several development projects were getting mired in litigation on environmental grounds, leading to needless delays. Concluding his introductory remarks he said the Committee was not in any manner guided by the Ministry and their recommendatory report would be submitted to the Union Government”, the statement said. Speaking next, Leo F Saldanha of the Environment Support Group requested the Committee to address the basis for its functioning, and whether the terms of reference (TOR) constituting the Committee was sufficient for such a massive and onerous task that involved fundamentally reviewing all environmental laws that were intricately linked to Right to Life, Clean Environment and Livelihoods. He sought to know what it meant, as is main TOR, “(t)o recommend specific amendments needed in each of these Acts so as to bring them in line with current requirements to meet objectives". Saldanha argued that “it is disturbing that Subramanian unilaterally rules a legitimate concern over vague and weak TORs as being of trivial concern, when, in fact, it would have been fit and proper for the Committee to have first explained in the interest of public accountability and transparency how they found the terms rational and acceptable to them. And in case the terms were acceptable, then the High Level Committee, unshackled as it were by the bureaucratic norms of the Ministry, could have provided a clear note on the nature of the reforms being considered and also explicated on the procedure of consulting and receiving criticisms from various sectors, peoples, regions, geographies, etc”, the statement said. “Vinay Sreenivasa of Alternative Law Forum submitted that the process by which the Committee was conducting the consultation was rather opaque. The vague TOR and the fact that the Committee was constituted by a Government that sought to belittle the importance of the National Wildlife Board and rush pet projects through the clearance mechanism, seemed to suggest the entire exercise appeared to be merely ritualistic. Aruna Chandrasekhar of Amnesty International - India sought to know what specific amendments were being proposed or demanded by industry/corporate sectors, and requested the Committee put it all out”, the statement said. Shame on MR. TSR and his committee - do they not understand that development cannot take priority over life. Does the government not understand that they represent the people - it does not own them ! Does the government not understand that "public hearings" are meant for "hearing the public" and NOT for "lecturing or haranguing the public". Mr. Modi, who is advising you ? Do you want to lose all the goodwill you have earned even before the year is out ? Pls give up this obsession on training to impress the "foreign investors" and spare a thought for the people of India who have put you there to look after them and not to betray their interests and welfare in the name of some elusive development that has never made a difference.